With Knorr Chicken Fajitas, you can make this classic Mexican chicken recipe in the comfort of your own kitchen. 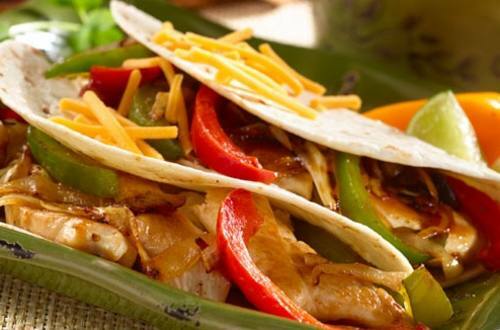 Your mouth will water as grilled chicken, onions and peppers sizzle in a soft flour tortilla. 1 Heat 1 tablespoon oil in 12-inch nonstick skillet over medium-high heat and cook chicken, stirring occasionally, until chicken is throughly cooked, about 5 minutes. Stir in 1 teaspoon Knorr® Chicken flavor Bouillon; remove chicken and set aside. 2 Heat remaining 1 tablespoon oil in same skillet and cook green peppers and onion, stirring frequently, until golden and very tender, about 8 minutes. Stir in garlic, cumin and chipotle and cook, 30 seconds. Remove from heat. Stir in remaining 2 teaspoons Bouillon. Stir in chicken and lime juice. 3 Serve in tortillas and garnish, if desired, with your favorite fajita toppings such as shredded cheddar cheese, sour cream and/or chopped cilantro.